A variety of management techniques are commonly used to maintain Tallgrass Prairie sites as resilient and properly functioning ecological communities. One of these techniques is prescribed burns, which can reduce the encroachment of trees, shrubs, and invasive plants, while stimulating the germination and growth of native prairie plants and improving the overall health of prairie habitats. Though burns are the preferred management method, they are not always feasible for landowners to undertake, thus mowing can be used as an alternative disturbance factor. When brush-cutting alone is not enough to control competing vegetation. 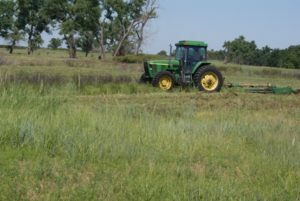 While trying to determine whether mowing is appropriate for your prairie site, there are several factors to consider. One of the advantages of mowing as a management technique is that it is relatively easy and does not require special training, whereas prescribed burns have to be carried out by people who are properly trained. Secondly, most people already have a mower, which makes this technique very economical for small scale projects. In addition, mowing may reduce herbicide use because it keeps many common weeds at bay, and there is little to no public concern with sites being mown instead of burned. The advantages of mowing need to be weighed carefully against some of the potentially negative consequences that can result from it. Firstly, mowing can result in harm or mortality to wildlife, including frogs, snakes, and beneficial insects. Secondly, mowing can promote the spread of non-native invasive plant species by encouraging the growth of weedy grasses like crabgrass that thrive on regular mowing in urban lawns and boulevards. Thirdly, after regular mowing, grass clippings are often left behind, providing a constant supply of nitrogen to the field or lawn that encourages the growth of non-prairie grasses and weedy introduced plants. 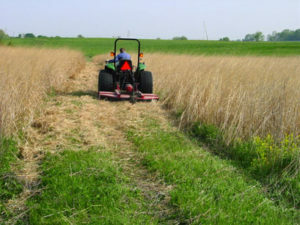 In addition, seeds, fruits, stem fragments, and insects of unwanted species could be spread unless equipment is properly cleaned before mowing a prairie site. Finally, mowing may result in accidental oil and gas spills on the site. 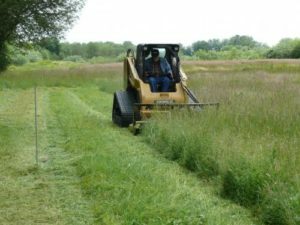 Though mowing is a relatively simple technique for Tallgrass Prairie site management, it is important to take certain precautions if your property abuts a natural area where there are known populations of snakes. Guidelines for proper mowing listed below will also be helpful to protect other animals such as toads, frogs, and insects. Prior to mowing do a walk-through of the site to visually determine whether any snakes are present. If you see snakes, wait to do your mowing until the snake has left the area. If possible avoid mowing during the active season for snakes (April to November). Consider leaving cover for wildlife throughout winter by leaving long grass until spring. Keep the mower deck at the highest setting to reduce the chances of snake injury or mortality. During the active season for snakes (April to November), mow only on days when the air temperature is above 21º to ensure snakes are mobile, and mow slowly enough to allow snakes to escape. Consider leaving portions of prairie un-mowed altogether. As one of the stewardship initiatives associated with the Herb Gray Parkway, the Ontario Ministry of Transportation is currently developing a vegetation best management practices guide for landowners to protect snake species at risk, which will be posted on the TGO website soon. Rodger, L. 1998. Tallgrass Communities of Southern Ontario: A Recovery Plan (pdf). World Wildlife Fund and the Ontario Ministry of Natural Resources.